Etymology: from Sequoyah, Indian Cherokee, inventor at the beginning of the XIXth century of alphabet cherokee. Origin: sequoias grows naturally on the Pacific coast of USA, the Redwood near the Peaceful coast of California and south Oregon, the giant sequoia on the west mountainside of the Sierra Nevada. Appeared on earth there are 200 million years, fossils found to date show that the redwoods spread over all continents and counted up to forty species there are 60 million years. The Giant Sequoia was still present in Europe recently and disappeared from France 12,000 years ago, eliminated by the Quaternary ice ages. Its natural range is also reduced in America, where he survived at Southern California. European colonists who settled on the California coast in the late eighteenth century had discovered the redwood (Sequoia sempervirens (Lamb.) Endl. ), which height exceeded 100 m tall. But the hostility of the Indians prevented them from venturing into the territories of the interior. In 1823, during an expedition to connect Salt Lake City to Santa Fe, the trapper Joseph R. Walker crossed for the first time the Sierra Nevada and discovered the giant sequoias. But it was not until 1852, with the gold rush, a scout in charge of supplying the workers discovered one of these giants and the news spread around the world. Growth: fast. Sequoias planted in Europe somewhat more than 100 years ago attain 30 m tall. Sequoia have a system root which stretches in width. - the Giant Sequoia (Sequoiadendron giganteum) was introduced into Europe in 1853. It is recognised by its trunk which flares at the base. A subject, in the United States, attained such breadth (10 m), that they dug a (narrow) road tunnel across are trunk. In France, the biggest measures (only) 4,2 m of diameter and 13,3 m of circumference at 1 m from the soil. It is in Chalus, Vienna. 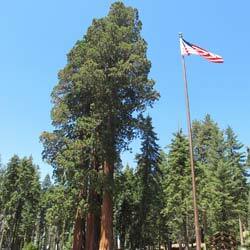 The giant sequoia holds the record of lifespan (2.000 years). Fruits (cones) of the Giant Sequoia take two years to mature and stay longer even on the tree. - the Redwood (Sequoia sempervirens) was discovered by Menzies in 1769 and introduced into Europe in 1840. Its name is "Redwood" because of its red wood. It is the highest tree in the world (113 m in the United States, West coast), but it was beaten by an Australian eucalyptus (which attained 132 m). The highest in France are in the forest of Ribeauvillé, in Aisne (52 m, planted in July 1856 in honor of the birth of the son of Napoleon III) and in the Doubs, village of Russey (55m). It grows fast, reaching 30 m in 30 years. It suckers from the roots. Its wood, devoid of resinous channels, is used in joinery. Fruits attain maturity at the end of one year. The thick bark protects them in case of wildfire. Habitat altitude, humidity, light, acid soil. Form conical narrow columnar, rounded crown. In general, he is devoid of branches on a third or the half of his height. Leaves in awl (scales around the stem) shorter, flattened needles at the beginning and the end of stem (in "racket" form). Legends and Traditions: Indians of the Sierra Nevada venerated giant sequoia as the pillar of the world, around which everything was created. They also called it the Tree Phoenix for its ability to resist fire and to "resurrect". Use: the wood is of medium quality. One makes pencils, stakes, building poles and can be triturated (long fibers) for the manufacture of chipboard. A mature tree produces more than 1000 cubic meters of wood. 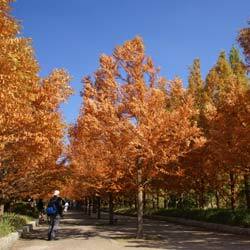 In Europe, it has been planted in most large parks in the nineteenth century. The relict forests of giant redwood were slaughtered widely in USA and only at the beginning of the twentieth century that Americans began to realize that they must be preserved. This was the creation of national parks that protect these trees still outstanding. Reproduction: These trees are pyrophytes: reproduction is favored by fires that reduce forest cover and cause the opening of their cones. The seeds may escape and young trees receive full light they need. Redwood quickly developed a deep central (vertical root improves the stability of the tree). It becomes impossible to transplant. It is planted from seed. Where to see Giant Sequoias near Paris? in the park of Sceaux (south of Paris), near the Pavilion of Hanover. Where to see a Redwood near Paris? in the wood of Vincennes, near the false cave. They resisted the storms of the end of 1999 (while 33 % of trees of woods of Vincennes and of Boulogne fell down).